The region famously referred to as Chobe, is the area of the Chobe National Park along the riverfront and getting there is easier than imagined with a well developed road and air network. All Siybona safari tours into Chobe include return flights from Johannesburg. Depending on where your journey starts you may put down at Maun on the Okavango Delta, or Livingstone Airport in Zambia for the short road transfer to Kasane. The Chobe River and Kasane, lie on the north-eastern most point of Botswana at the border of four countries: Zambia, Zimbabwe, Namibia and Botswana. The Zambezi River and the Chobe River are the borders between these countries. View a more detailed Map of Botswana The Chobe National Park can be accessed from all sides, and all the neighbouring countries, by a normal sedan vehicle. However a four wheel drive vehicle is firmly recommended for negotiating the roads in the park, with the exception of the main road to Namibia which is a tarmac road. 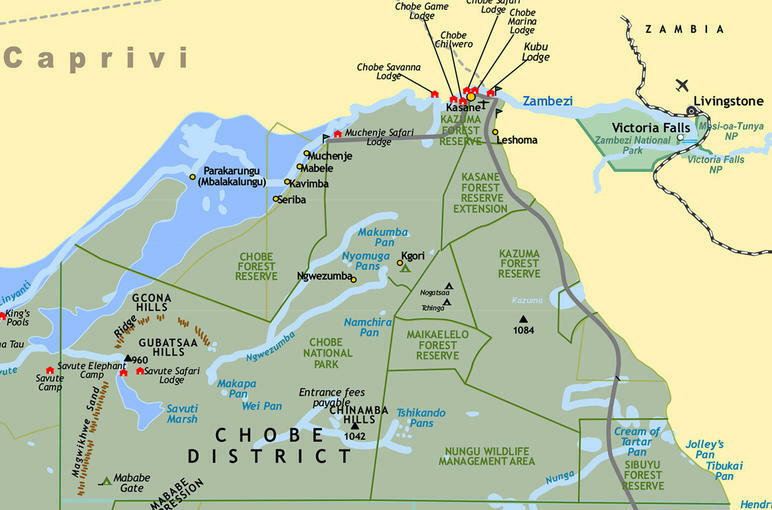 From Zambia, Chobe and Kasane can be accessed via the Kazungula Ferry, a short trip of less than ten kilometres. But dont be fooled. It is also a slow trip as a result of the many heavy trucks lining the road for kilometres on both sides of the border. From Zimbabwe the parks can be reached via a well serviced tarmac road - Victoria Falls is a 70 km drive away. For this reason days trips can be organised into Chobe from Victoria Falls or vice versa. 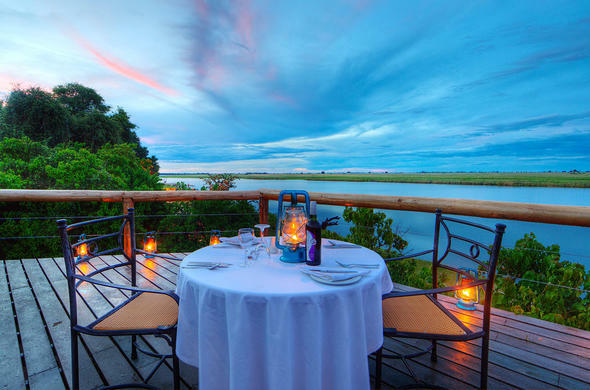 Kasane lies across the river from the furthest point of Namibia's Caprivi Strip, but from Namibia, Kasane is accessed via the Ngoma Bridge over the Chobe River more than 70 km away. The road from Ngoma Bridge runs through the Chobe National Park and it is not uncommon to see multitudes of wildlife en route. Kasane is 1300 km from Johannesburg and 900 km from Gaborone via Francistown and Nata. From South Africa there are a number of border posts that can be used to cross into Botswana. If you want to travel by road, the tarred road that links Maun to Chobe is the 600 km stretch of Trans-kalahri Highway, across the vast flatlands of the Makgadikadi and the wildlife-rich regions bordering the Chobe National Park. Make sure you are gassed up, and have a spare jerry can of petrol, an extra spare tyre and enough water to drink. Be aware of the possibility of animals on the road.